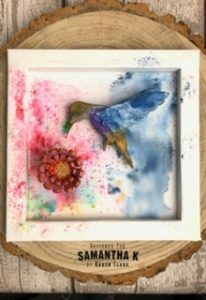 I received great feedback for this piece and hope you enjoy the inspiration using the fab Humming bird kit which is so cute and easy to construct. 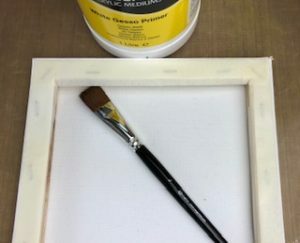 I used the reverse side of a box canvas and covered the stapled edges with masking tape. 2. Then applied gesso primer and dried. The tape wrinkles but that adds to the arty/mixed media affect which is ok.
3. 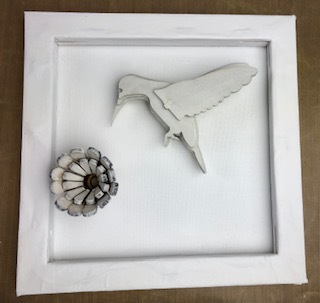 After assembling the hummingbird and flower I again applied gesso. I wanted any areas not coloured to show through white and for the colours to be quite vibrant which is why I used the white primer. You can apply Brusho to the bare MDF if you prefer. 4. I then decided where I wanted the elements to sit on the canvas and removed the hummingbird. 5. 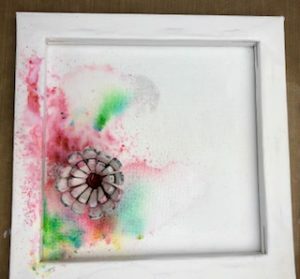 Without adhering the flower I simply placed it in position on the canvas and sprinkled then spritzed water on to the Brusho to colour the canvas in that area. 6. I then removed the flower and added the Brusho colour to it, drying and building colour as I went along. I ensured the canvas was dry too. 7. 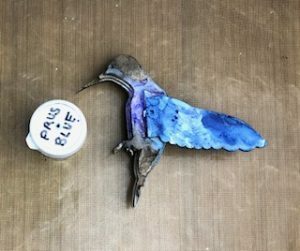 Next I coloured the bird with Brusho’s, I roughly water coloured with a brush by mixing the colour/s with water on my craft mat. Drying and adding more colour until I was happy with it. 8. I then sprinkled Brusho colour and spritzed water to colour the right side of the canvas behind where the bird would sit, again layering and drying as I went. I forgot to take a photo at this stage! 9. Once the canvas and elements were coloured and dried I adhered both the flower and hummingbird to the canvas. This can be done with either a glue gun or gel medium.